If non-surgical options do not improve the symptoms, spinal instability is commonly treated with a spinal fusion surgery focused on the particular area of the spine with the problem. During spinal fusion surgery, which is performed under general anesthesia, two or more vertebrae are connected. This is accomplished with the use of a bone graft from another part of the patient's body or from a bone bank. The donor bone is placed between the vertebrae and held in place with plates, screws and rods as the bone tissue merges. 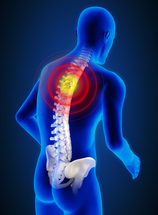 Eventually, as the vertebrae fuse together, the spine becomes increasingly stable and the patient's pain diminishes.